Disability platform lifts make all businesses accessible to everyone. Hotels, museums, shops, garden centres, restaurants and offices all benefit from installing disability platform lifts. They enable people with a variety of conditions affecting mobility to live normal lives. The Equality Act 2010 requires companies to make reasonable adjustments for workers with disabilities. Many companies are taking the needs of disabled people on board and making changes to the working environment. People with substantial mental or physical impairment and restricted vision are protected under the Equality Act. This means they should not be discriminated against in terms of education, employment and dealing with the police. Companies are no longer able to discriminate against workers due to their disability. This applies to recruitment, accessibility in the workplace and in terms of redundancy. Reasonable adjustments to the working environment have to be made to accommodate those with additional needs. Accessibility is becoming a big issue particularly as our attitude towards disability is improving. We no longer assume someone with mobility issues is incapable of carrying out many types of work. It is the eighth Global Accessibility Awareness Day on the 9th May 2019. It focuses on ways to improve digital and physical access as well as inclusion in all aspects of life. Our understanding of disability has greatly improved resulting in many people with disabilities being able to live normal lives. We are more aware of invisible disabilities such as heart, conditions, breathing issues, ASD and neurological conditions which are difficult to see but affect people’s mobility. Businesses and visitor attractions are making huge leaps and bounds in making their premises accessible but we still have a long way to go before the world is fully inclusive. According to SCOPE there are currently 13.9 million diabled people in the UK. This breaks down into 8% of children, 19% of working adults and 45% of pensioners registered disabled. (Source: Family Resources Survey 2016/17) There are 3.4 million disabled people in employment. Typically disabled poeple are twice as likely to be unemployed than their able-bodied counterparts. A 10% increase in employing disabled people would contribute an extra £12 million to the British economy by 2013. (Source: Scope ‘Enabling Work’ (2015) It is therefore hardly surprising that the majority of disabled people live in poverty and have to meet the added costs of supporting their disability. Disabled people are less likely to be able to enjoy cultural events due to accessibility and financial restraints. Disability platform lifts make a major difference to the working environment. Managers are able to recruit the best people for the job without discriminating against their disability. Museums, theatres, visitor attractions and cafes with disability platform lifts allow visitors with restricted mobility to experience culture and the arts. Improving accessibility and mobility in public places really does make a difference in people’s lives. Challenger Group supply a variety of disability platform lifts to suit a range of applications. They are designed to conform to the Equality Act 2010 and the Disability Discrimination Act 2005. The lifts enable the safe movement between 2 – 6 floors in commercial, retail and public access buildings. Each lift is self-supporting and only requires fixing to the floor at each level it has a capacity of 400 kg (4 people) and comes with a variety of safety features. 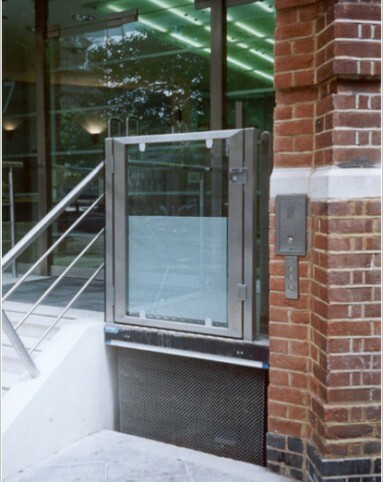 Lift access can be via a ramp or at floor level depending on individual requirements. If you would like to find out more about our disability platform lifts contact us and we would be happy to offer advice.